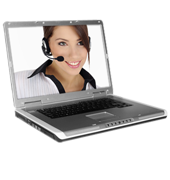 Blue Jean Networks’ Proactive Managed Desktop Care provides comprehensive preventative maintenance services remotely. This solution is comprised of: a desktop/laptop agent within the Blue Jean Networks technology platform with all of the intelligence built-in to conduct day to day preventive maintenance services, a bundled managed Anti-Virus Package, and remote access. Empower your staff by giving them direct access to Blue Jean Networks’ unlimited phone and remote support. Our Flat-Rate resolves the issue of having to wait for approval to increase IT support costs. With Desktop & User Care, we generate detailed inventory reports and configurations related to all the preventive maintenance activities conducted through the Blue Jean Networks Network Operations Center (NOC). We track serial numbers, license expirations, warranties, vendor information, detailed service responses and much more. The platform comes with a built-in scripting engine and can also be used to deploy software applications remotely and automatically.